Layers of fluffy white cake using alternative grains are smothered in vanilla-flecked, Earl Grey infused buttercream before being engulfed in delicate crepe ruffles. Happy 2017! Happy 2017, everyone! We are already on week 2 of the New Year, and I finally have something new to share with you today. It’s a layer cake, of course, but it’s no ordinary cake. Before you get nervous and start browsing elsewhere because of the title, let me tell you that I won’t be turning gluten free any time soon, nor will this blog. This space will still be packed with wheat flour-driven recipes – as well as loads of butter and eggs, at times. But 2017 is all about trying new things and pushing boundaries (for me, at least), so I thought I’d kick off the year with a little something different. I am not one for making New Year’s resolutions – are you? At the top of each year I always vow to just be a bit better – exercise more often, eat less cookies, try to keep better sleep habits, be more present with my son, love and forgive myself, etc. You know, the things I should be trying to do all year, each year, but need a gentle reminder or “reset” after a holiday season full of indulgence. I don’t actually write any of these things down, because 1) I generally already know what I am supposed to be doing to stay healthy and happy 2) I am not very good at sticking to a list of resolutions even though I know what’s best for me (see reason number 1) and will routinely still stay up to 1am watching Netflix or binge on pizza because I temporary “forgot” I was trying to be “good” and 3) failing to comply such lists interferes with the “love myself” part since I tend to be so hard on myself most of the time. In addition to the above-mentioned healthy and happy habits, I do want to push myself this year. I don’t need to go cliff divining to feel alive or anything crazy like that, but just to try new things – like finally making sourdough starter and finish decorating our not-so-new-anymore home. Business wise, I want to push myself out of my comfort zone creatively and expand my recipe repertoire(see sourdough starter and gluten-free cake). And for you guys? I hope you will join me. 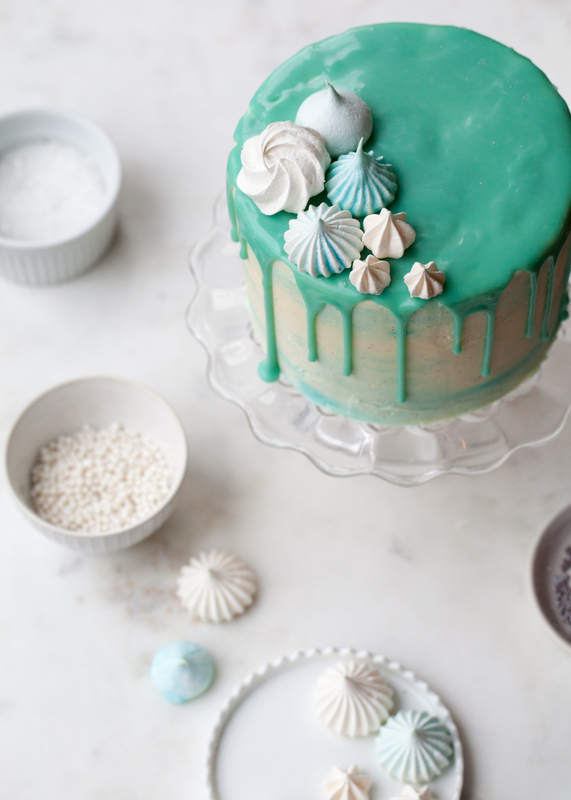 I hope you will push yourselves to try out a few new recipes and follow along with my cake decorating tutorials. Judging by how much more popular my How-To posts are, you are all already eager to learn and grow already. I hope to make more creative cake designs with tips and tutorials for you to experiment with and call your own. As for the cake…Fear not, this is the most delicious gluten-free cake that has ever come out of my kitchen. There have been a ton of flops – let me tell you. In most of my past gluten-free “experiments,” I’ve simply just swapped out all-purpose flour for coconut flour or whatever else I happen to have at home. Guys, it really doesn’t work that way. Like other baked goods, gluten-free items still need balance when it comes to texture, structure, and flavour. I am still learning myself, by thankfully the super-talented Alanna of The Bojon Gourmet did most of the work for us and put it all in her GORGEOUS book Alternative Baker. I received a copy for Christmas and was eager to put some of her tips to the test. I stocked up on a few alternative grains and hit the ground running. Of course this cake doesn’t taste exactly like my standard butter cake recipe, but why should it? It uses a trio of grains, white rice flour, oat flour, and millet flour, that not only provide a tender crumb and surprisingly fluffy texture, but also flavour! 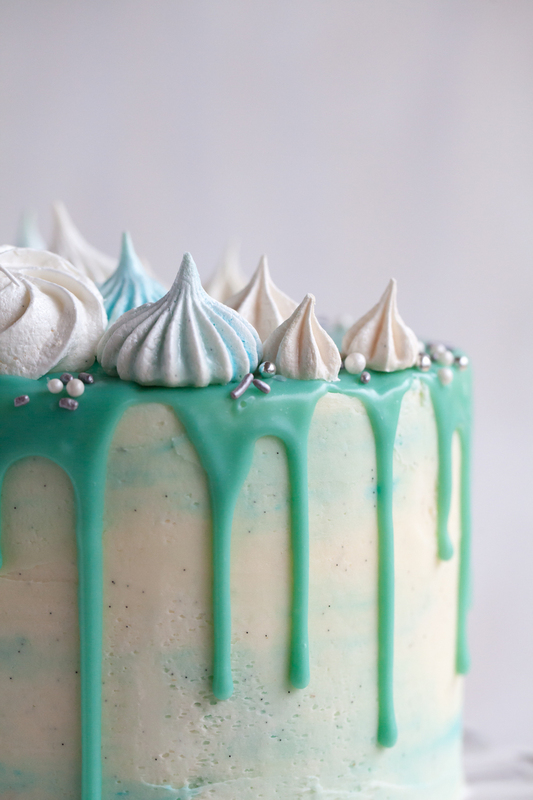 I was still a bit hesitant when assembly the cake, so I split each layer in half and smothered them in my favourite Earl Grey buttercream from Layered. It tastes soooo good! Truthfully, I could have let the cake layers shine on their own, but that extra does of Earl Grey buttercream is heavenly. 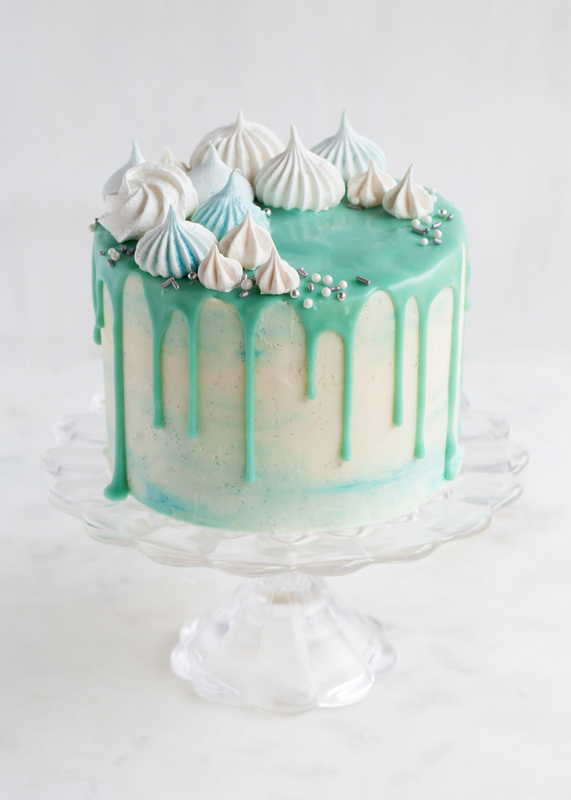 I’m in love with the flecks of real vanilla bean and little bits of tea within the buttercream. 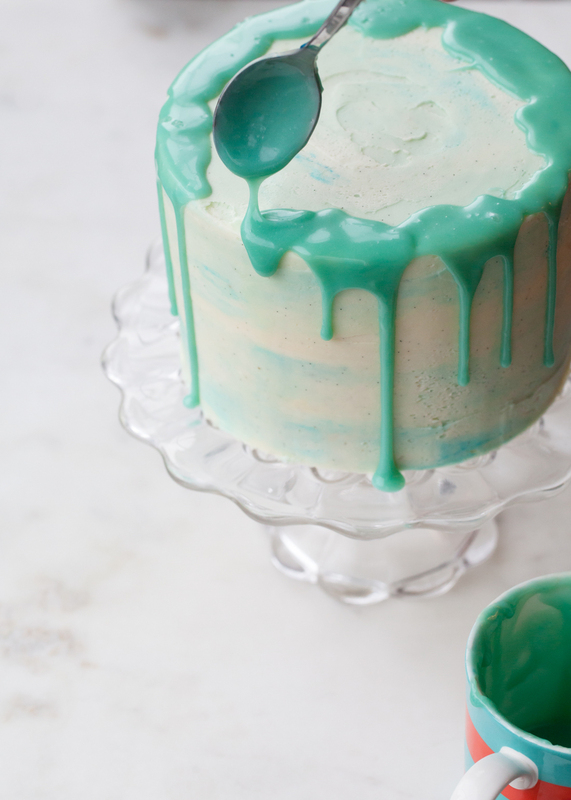 Seriously, there is SO MUCH flavour to this frosting! In my book, I paired it with a chocolate cake, poured a heavy portion of salted caramel sauce over the top, and called it a London Fog Cake. When publishing, I wasn’t sure how popular this flavour combination would be. To my surprise, it is definitely a fan favoroute! Who would have thought? A London Fog is a vanilla-sweetened Earl Grey tea latte. 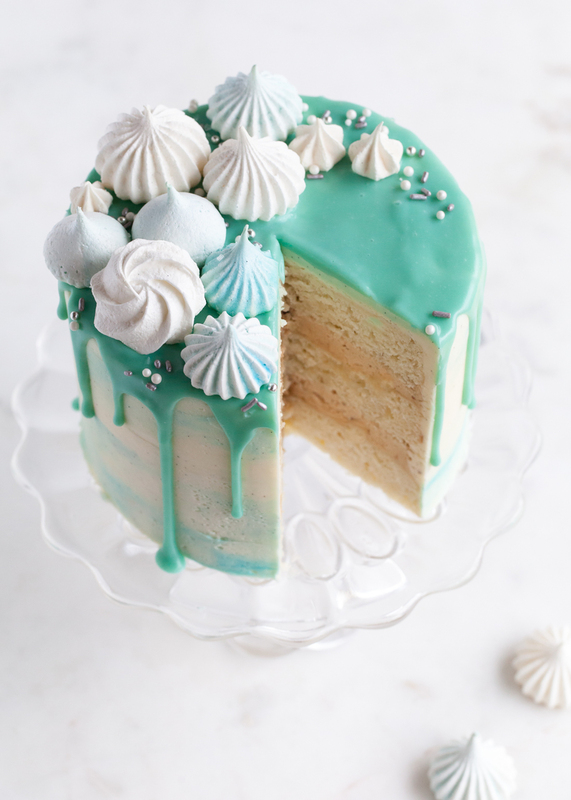 Pairing the Earl Grey buttercream with a vanilla cake is actually a bit more indicative of the name, and I am so glad this version turned out to be just as delicious as my original cake. Tune back in later this week to find out How to Make a Ruffle Cake!! Pre-heat oven to 350 degrees F. Grease and flour three 6-inch round cake pans and set aside. Using an electric mixer, beat the butter on medium-low until smooth. Add the sugar and mix on medium for 3 to 4 minutes or until light and fluffy. Add the oil and mix until combined. Working one at a time, mix in the eggs and egg yolk. Add the vanilla and mix until combined. Stop the mixer and scrape down the sides and bottom of the bowl. With the mixer on low, add in half of the dry ingredients. Once they are mostly combined, stream in the buttermilk. Add the remaining dry ingredients and mix until just combined and smooth. Evenly distribute the batter between the prepared pans. Bake in the pre-heated oven for 25 to 30 minutes, or until a toothpick inserted into the center of the cakes comes out clean. The tops should be slightly golden. Cool on a wire rack for 15 to 20 minutes before removing the cakes from their pans. Wait until the cakes have completely cooled before slicing in half horizontally to create six layers (if planning to do so). NOTE: This cake is fairly tender. If you want to be safe, line the bottom of each cake pan with a parchment round for easier removal. Place 1 cup of the butter in a saucepan with the loose tea. Heat over medium heat until the butter melts, then reduce the heat to low and simmer for 5 minutes. Remove from the heat and let the tea steep for 5 minutes more. Strain the butter through a fine mesh sieve set over a bowl and refrigerate it until is reached the same consistency as softened butter, 20 to 30 minutes. Small bits of tea may remains in the butter. 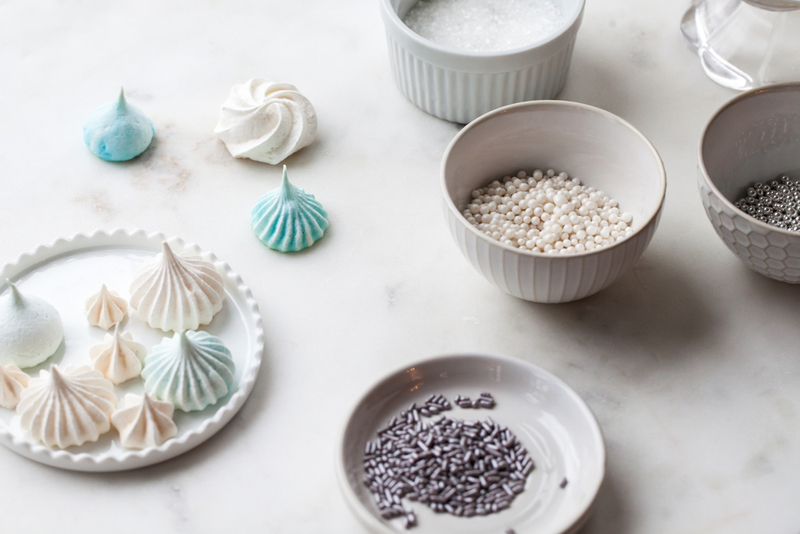 Stay tuned for a sweet GIF and tutorial for how to create the delicate crepe ruffle finish!